Here you can change settings concerning the graph frame, ticks and numbering. You can change the ratio of x-axis length to that of the y-axis by this item. A setting "4/3" is the same as "40/30". The width/thickness of lines to draw the frame, ticks and grids can be modified with this item. The settings in this section are relevant only in the "presentation" plot. By this item you can change colors to draw the frame rectangle of a graph. If you make a check on an option "none", the frame of the graph is not drawn. At the same time, if options of "same as frame" are checked in other items such as numberings and labels, those will not be drawn, either. By this item you can change background colors all over a graph. An option "none" is checked in the default. This means the background is transparent. By this item you can change background colors inside of a graph. An option "none" is checked in the default. This means the background is transparent. Colors of the ticks are changed by this item. An option "same as frame" is checked in the default. This means the tick color is the same as the frame color. You can select a line type of the grid among "solid", "dotted", "broken", "chain" and so on by the list-box. The grid will not be drawn as long as the item "with grid" is not checked in the [Plot] menu. Colors of the grid are changed by this item. An option "same as frame" is checked in the default. This means the grid color is the same as the frame color. You can draw the tiks inside ("in") or outside ("out") of the graph area. If you do not need ticks, select "none". Make the check off, if you do not need numbering. 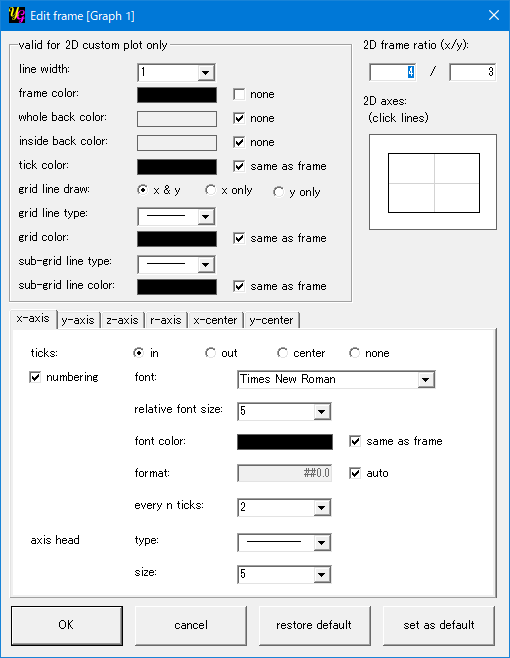 You can use any fonts you installed in your pc to draw numbers on each axis. The fonts are listed in the present list-box. The window will be closed with saving the modification by pressing this button. The window will be closed without saving the modification by pressing this button. Default settings of this window will be loaded by pressing this button. You can save settings you make in this window will be saved by pressing this button.